Extremely reticent to talk to the Spanish media in the past, the club’s all-time leading scorer faced the cameras afterward to explain why his team over the last week had secured only two out of a possible nine points in the Spanish league. Messi then pointed to Barcelona’s upcoming Champions League trip to Wembley Stadium, where the defending Spanish champions play Harry Kane’s Tottenham in a Group B game. At age 31, Messi is in his 15th season with Barcelona’s first team and has long been the player his teammates turn to for the decisive dribble, pass or goal. But this campaign he has the added responsibility of wearing the captain’s armband that was handed down by Andres Iniesta after his departure to Japan. Besides talking to the media, Messi was also the team’s vocal defender on the field. 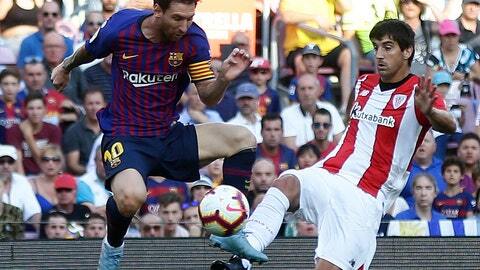 Messi argued long enough with referee Jaime Latre after the final whistle of Saturday’s match where he earned his first booking of the season. Barcelona’s defensive troubles could be magnified in London against Tottenham, with Barca missing half of its starting backline. Center back Samuel Umtiti will serve a one-game suspension for his sending-off during Barcelona’s win over PSV. That means Clement Lenglet, who joined the club this summer, will team up with Gerard Pique in the center of the defense, while Nelson Semedo is the squad’s only available right back. Madrid started the season well enough, leading some commentators to argue that the team’s collective attack was as dangerous as the huge individual threat once provided by Ronaldo before his exit to Juventus this summer. Gareth Bale, who has scored four goals this season, picked up an unspecified leg injury against Atletico. Left back Marcelo, who often joins the attack, missed the derby due to a muscle injury in his right leg, and midfielder Francisco “Isco” Alarcon underwent surgery for an appendicitis. “We have to find solutions and put all our faith in our squad,” Lopetegui said after the draw with Atletico. With Karim Benzema in poor recent form, Mariano Diaz could get more playing time after scoring two weeks ago in Madrid’s 3-0 win over Roma.